This fun-for-all ages church experience offers hands-on creative fun and a delicious meal for people at all stages of their faith journey. Messy Church will take place the second and fourth Wednesday of each month from 5:30-7 p.m.
Church Gets Messy at St. John’s UCC! Whatever images and words come to mind when you picture “church”, Messy Church at St. John’s UCC in Weldon Spring will likely be something new. 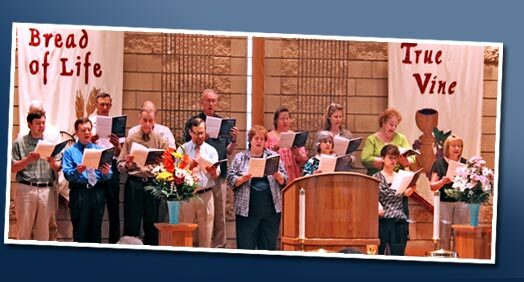 Beginning on January 9 at 5:30 p.m. and continuing the second and fourth Wednesdays of every month, St. John’s will take the main elements of worship out of the traditional setting to appeal to a part of the community who may not have a church home. The twice-monthly events use hands-on activities to explore Bible stories, reflect a God of creativity and give people a chance to play together. People at St. John’s Messy Church will gather from their busy lives and reconnect with each other over a shared meal, then activities for playing and working together begin to explore the theme of that night’s Bible story. A short interactive celebration time of story, song and prayer follows the activity time. Messy Church is for adults and children to enjoy together – every element aims to be relevant and accessible to all ages. Each night will also include a message from Pastor Todd and the second Wednesday of each month, we will celebrate the sacrament of Holy Communion. If you have any questions or would like more information, please email office@stjohnsweldonspring.org or call 636-926-8995.